Asian artisans. 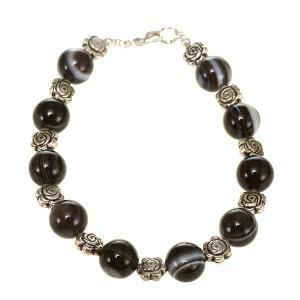 This bracelet features sardonyx agate stones alternated with delicate silver floral beads. Agate is a close cousin of chalcedony and comes in a wide variety of colors. The spherical stone beads used in this particular creation are patterned with natural stripes and feature smoky tones ranging from dark brown to cream. Agate has been used in the crafting of jewelry and ornaments since ancient times and is believed to have powerful protective properties. The bracelet features a lobster claw clasp for easy closure, and it measures approximately 8 inches long. This beautiful bracelet has been entirely handmade by skilled northern Thai artisans using only the finest hand-picked stones.